ST. LOUIS, Aug. 14, 2018 /PRNewswire/ -- To eliminate consumer confusion in light of recent news regarding the pesticide ingredient glyphosate, Spectrum Brands, Inc., is notifying consumers that glyphosate is not an active ingredient in its widely available line of Spectracide® Weed & Grass Killer products. 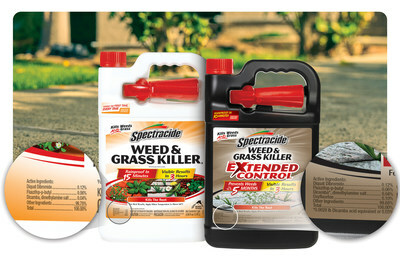 For more information about Spectracide products or the active ingredients used in them, please visit our website at www.spectracide.com or call Spectrum Brands Consumer Services at 1-800-917-5438. The power is in your hands to keep your landscape in line – unleash it with Spectracide® lawn and garden products. Our easy-to-use, fast-acting insect, lawn disease and weed control solutions help you tame lawn and landscape invaders with incredible pest-punishing power. Take command with Spectracide® brand. For more information, visit www.spectracide.com.